Protect your hotel’s brand and reputation from bed bugs and other pests that could ruin your guests’ stay with Pathway Pest Control hotel pest control program. Have many years of experience working with hotels, which has enabled us to develop best practice standards to offer the most effective pest control program. Our hotel pest control program can be customized to suit any size hotel, from small to large, and offers full Integrated Pest Management service, from pest prevention through to elimination, as well as pest awareness training for front line staff. Different parts of a hotel face different pest challenges. 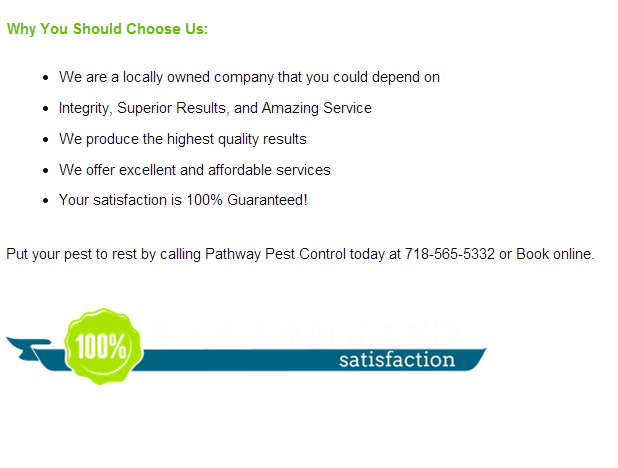 Pathway Pest Control will develop customized service programs targeted to specific areas of a hotel to keep these areas pest free. When we develop a service program for your hotel, we will ensure that your business complies with all international and local regulations relating to pest control and health & safety.